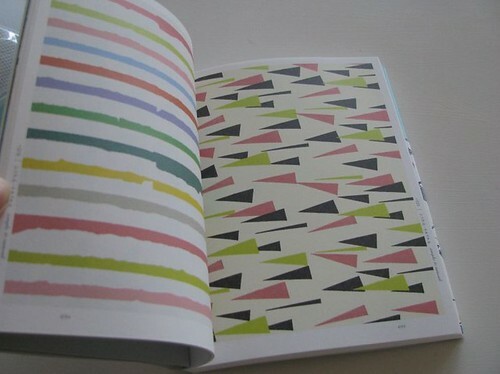 One of my favourite websites to click through from time to time belongs to Linnet, a Japanese notions shop. I try to absorb as much of it as I can and hope that anything I make as a result isn't too derivative. It's all just too beautiful. I read a post about Selvedge magazine on Whip Up yesterday and revisited Selvedge's lovely shop -- and learned that they also have a few free patterns on their website. One of them is for a Linnet bag! It has a lace facing! What could be more perfect? Oh and hey! Happy Hallowe'en! Candy for everyone. I have finally gotten around to adding a list of blogs I love to the sidebar. I procrastinated this for a long time! It took a few edits! It's still really long! I don't often comment on too many blogs, but I do read/browse many of them, and I hope you will like them just as much as I do. Incidentally, I don't have a tracker on this blog (ooh that would make me feel totally weird! ), and I'm not sure if I'm linked to in too many places -- if I appear in your list, thank you! And thank you for reading. I have been seeing a lot of vintage fur and faux fur collars / stoles / shrugs / capelets / tippets lately (thank you, Erica! ), and wanted to make my own. I had a vintage fur one, but I didn't have the heart to wear it, even if it was vintage. I no longer own it. There are only so many ways to "design" such a simple thing, but I tried to incorporate some elements that I specifically wanted in a stole. I wanted something that would look lovely paired with a silk dress or even with a t-shirt. Ribbon ties were essential, because they are more versatile than other types of fasteners, and because I do love a pretty bow. Recently I was lucky enough to acquire some fabric from a local high-end designer, and one of the fabrics I chose was a very soft, low pile faux fur. I am not sure of the fabrication but I suspect it is part viscose; it was manufactured by Menchi Tessuti of Italy, who specialize in blends of cashmere, angora, and silk. The quality of this fabric is incredible; I can only imagine how much it would cost under ordinary circumstances. It is so luxurious. Not as luxurious as real fur, naturally, but still luxurious. After a little experimentation, this was the result: The Hinterland Stole. April, I was thinking of you when I made it, and of course, of our woodland friends from Hinterland Who's Who. This item will appear in my Etsy shop, for, I think, $40 (maybe less, but no more than that), and will be custom-made, if I am given the opportunity to make more! This one is for me. I have lined the stole with black satin that I machine-quilted (there is a thin layer of cotton batting on the inside to make it nice and toasty), and the ties are made of grosgrain ribbon. When worn, it has a charming old-fashioned quality; think Mad Men, think early '60s -- everyone is talking about that style these days! I love it! I will have more pictures later because it looks better when worn, but for now, I hope you have enjoyed this sneak peek! This morning I woke up and was somewhat unhappy to see a light dusting of snow on the shingles of my neighbour's roof. I am not ready for winter! I don't have a winter coat yet, beyond an ill-fitting J. Crew pea coat that I use when it's particularly cold (for its Thinsulate lining!). Nor do I have sturdy boots that will hold up through the slush & sleet of Toronto winters, not to mention the awful salt I have to trudge through while walking to & from campus. Do you have good winter boots? I am terrified of breaking more bones on icy patches, and I hate wet feet more than anything. I had to get rid of last year's pair as I couldn't stand the sight of them after the interminable winter of early '08. I was happy to receive an e-mail from Toast earlier, directing me to the "Getting Colder" section of their website. I've been making a few things for the as-yet-non-existent Etsy shop, and I definitely have had cozy & warm thoughts in mind. The other night I made the "sample" (I cannot use these terms without having an "aw shucks" attitude about it) version of something that is going to have the word "hinterland" in the name. I've been wearing mine around the house for added warmth, and I've been drinking a lot of dark hot chocolate, too. Cocoa Camino, you and I will be good friends over the next few months. My bike ride home today was a very cold, crisp one, but there were lovely autumn smells in the air, and now, delicious carrot-ginger soup made just for me by Geoff. I know everyone loves the Toast catalogue, but I can only take it in small doses. The photographs are just too perfect and it makes me feel too covetous (which leads to dark, sad feelings). Some of you (Mia, in particular) know that I have a thing for unicorns, jokes about unicorns, and the DeCiccio Brothers Unicornery. Geoff and I were trying to decide what he could do for Hallowe'en, and he said something about unicorns. I went OH YES! and got to work. By that I mean that I thought about it for a little while. Here is his unicorn horn! It is impossible not to laugh while wearing it. Do not be fooled by his expression. A lot of the materials used here were things I already had. The inside of the horn is a styrofoam cone (with the top lopped off, mysteriously) that we found at an arts supply store for $1.50 or something like that, and it was the perfect material because I could just pin right into it. I covered it in the same white flannel I used for my candy corn costume. I had the gold braid from a time when I thought I would like to make a nautical-inspired summer tote, and I happened to have the faux fur trim as well. Don't ask. Let's just say I can't resist soft things and "buy 1 get 2 free" sales. The whole thing took me about, oh, six minutes to make while watching some Woody Allen movie on Saturday Night at the Movies. I love that it looks completely cobbled together and rough, I love that the "mane" looks like an acrylic mullet, and I love that he's going to wear a button-down white shirt with it. I am so charmed by it! 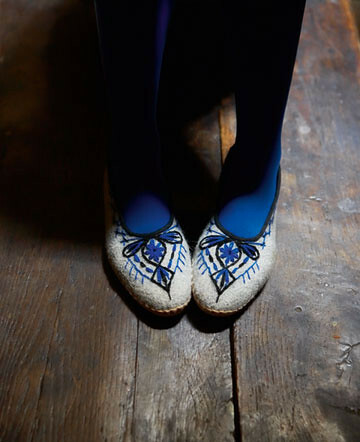 There will be faux fur cuffs at the wrists and ankles, and a tail, but this is the main part. The pièce de résistance, if you will. For someone who hasn't dressed up for Hallowe'en in over five years, I am certainly enthusiastic about the one coming up! I don't know why! Candy corn and unicorn -- together we are (here it comes) CORNY! My lovely boyfriend just started a new blog. The hope is that he will post new drawings to it regularly. I know I'm biased, but I adore his delicate style. I rarely dress up for Hallowe'en, but this year I made myself a costume. 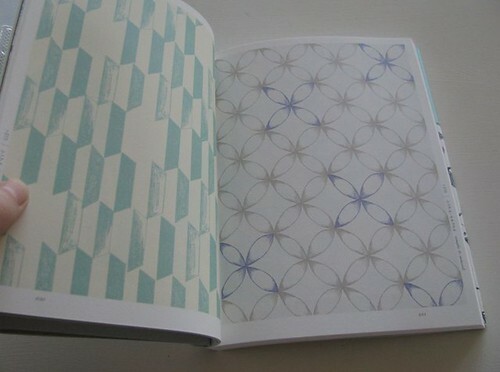 The dress is #20 from this Japanese dress book. It was so ridiculously easy to make! It's made out of cotton flannel because it was on sale ($2/m) and I liked the colours. I am going through a "thing" with flannel/brushed cotton at the moment, I guess. If I want to, I can use this dress as a nightgown! It's certainly soft enough. 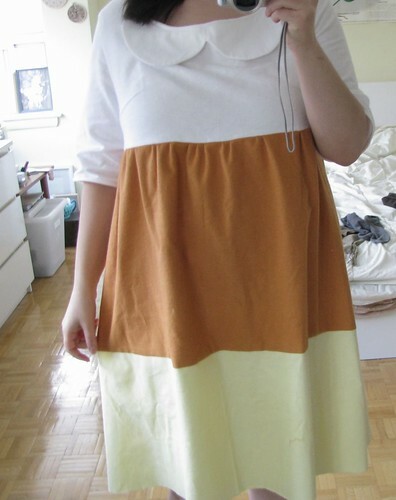 I haven't hemmed it yet, and I think I'm going to put elastic around the bottom of the sleeves. I also made a little rounded cap to wear on my head. I also, um, have to press it. Now I need to sort out what I'll be doing the weekend of Hallowe'en, besides going to a costume party for a baby's birthday on the Saturday afternoon. Do you Canadians remember the song "C'est l'Halloween?" I have it stuck in my head throughout the entire month of October. I'm going to re-open my Etsy shop in a couple of weeks, once I have some things to put in it. 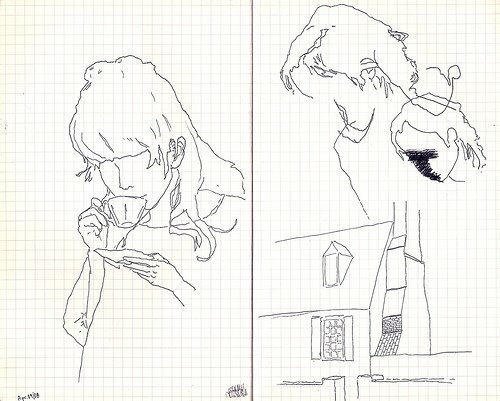 Geoff may be making some drawings -- original ones! We have some ideas, so I hope we can make it a reality. I was nervous about it before, but I think I'm okay with it now. Vintage plastic handles and found doilies have been sitting in a storage container for months now! I had the owner of a store in Kensington tell me to come see her once I had made some doily bags. I never made more. It's not too late, though. Oh and you should click here. Seriously, you won't regret it. A girl would have to be pretty kooky indeed not to appreciate a lovely bundle of knits sent to her in the mail! Don't you just want to bundle yourself up in that scarf and curl up with a good book? 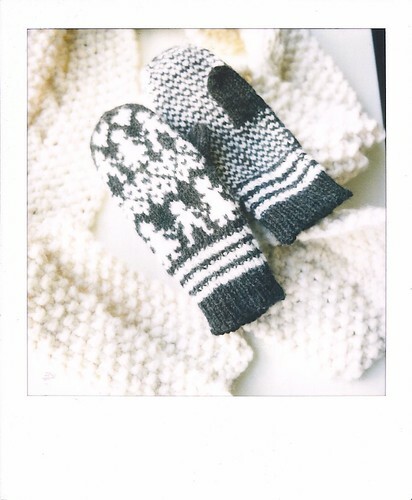 Aren't the little people & the little hearts on the mittens the sweetest? I may not know how to knit but I'm glad to know people who are so wonderful at it, and who are generous and kind! Thank you, Erica. I always find myself listening to the same things in the fall. For the past four years, it's been Sufjan Stevens' Seven Swans. That particular album has special significance for me, because Geoff introduced me to it when we first met, and I have a very fond memory of sitting in the cold on the rooftop at his old apartment while listening to it. That was a near-enchanted time in my life and so the things I listened to then are extra dear to me & make me remember things with a little pang of sorrow & joy. It was an autumn filled with the highest highs and the lowest lows. I liked being 25. 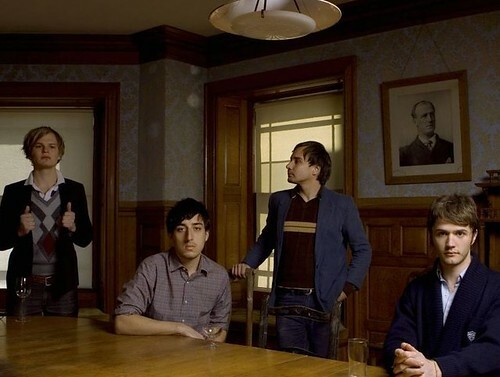 A couple of years ago I discovered Grizzly Bear, who are really a year-round favourite. I saw them last year and there didn't seem to be too many people at the show, which I think is a shame. Their music is heartachingly beautiful, and let's face it, these guys are a good-lookin' bunch (not an important criterion with music, but it helps). I listen to Yellow House a lot in the fall. "Colorado" gives me chills. Here they are! Last week I bought a CD (I haven't purchased a CD in literally YEARS): In Ear Park by Department of Eagles, which features a member of Grizzly Bear who happens to have the loveliest voice. It is fantastic. I think I may end up listening to it more in the spring/summer, but for now I'm playing "Herringbone" and "Around the Bay" on repeat. In early winter I will probably listen to A River Ain't Too Much To Love by Smog endlessly. The opening song, "Palimpsest" ("winter exposes the nests / and I'm gone"), always makes me think of a trip to High Park a few years ago, where I wound up taking pictures of bare trees with empty nests in them. There's just something about autumn and early winter that I love more than anything. I was just reading over some of my last posts and realized that I am really fond of diminutives. Sometimes I wish English had built-in ones so I wouldn't have to write "little" all the time. I like tiny things, cute little things, etc., and I tend to add "-let" to all kinds of things. Silly silly. Last night I finally got around to making a little needle book. I don't do too much hand-sewing (I avoid it when I can) but I am always trying to locate my hand-sewing needles. 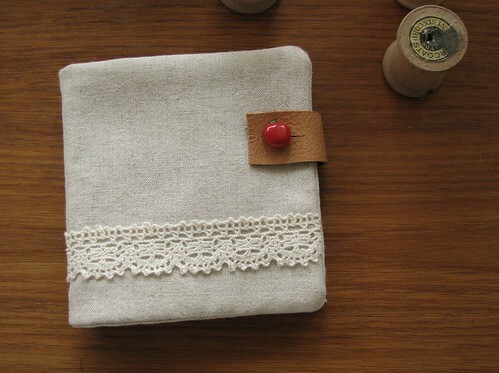 This little book was inspired by all the Japanese craft books I like to look through (linen, cotton lace, and a little piece of leather -- very "Japanese craft" elements). I was also influenced by a recent trip to one of the sweetest children's stores I've visited: Polka Dot Kids. I had never stepped inside as I rarely have occasion to buy children's things. I happened to pop in a few weeks ago after a croissant and coffee at Clafouti and was delighted to find a shop stocked with the loveliest Japanese and French imports. I wished everything came in adult sizes! Anyhow, I thought it would be nice if I could make something that looked as though it could have come from there, which is where the apple button fits in. 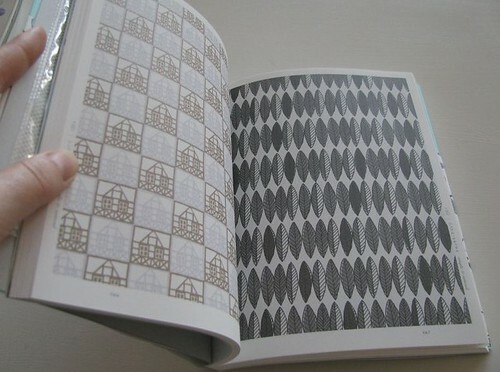 The pages are made of white cotton flannel, which is actually a lovely fabric I'd love to use more often. It's so soft! The needle book was made hastily, but again, I am learning to love imperfections. I was also inspired by Claire's new Etsy shop, My Favourite Dress. Claire has always been so sweet and has sent me lovely trims and laces in the mail. 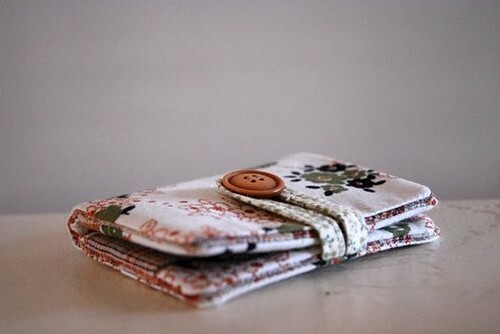 I gasped when I saw her little wallets; I am forever on the hunt for a wallet I like. When I saw that there is a pocket for coins, I immediately bought the Jenny wallet. I can't wait for it to arrive. And isn't the picture of it pretty enough to frame? I think so. I recently spent a few weeks making this plaid cape, inspired by the APC cape modeled beautifully here by Erica. 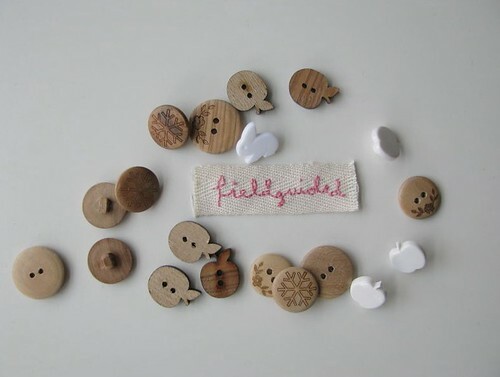 Remarkably, I had the buttons already, which I had found in my mother's button jar (one of my favourite things to play with when I was little). I bought the plaid wool at World Sew on Queen, and the lining is navy broadcloth. It is easy to find vintage cape patterns online. 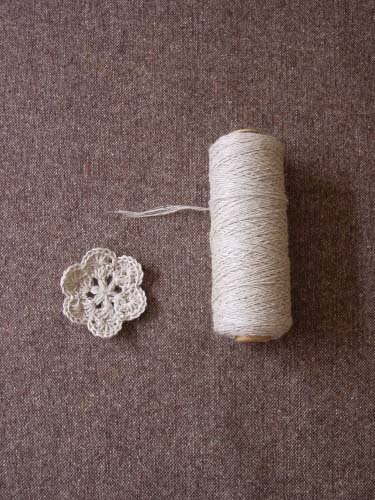 I used McCalls' 9028 from 1967, but McCalls' 9550 from 1968 is readily available on Etsy and I think it is a nicer pattern. It wasn't too difficult to make, but I had some trouble with the lining. As a result, I am not thrilled with the way it drapes, but I don't think this is something I will wear very often. I wore this cape the night of Nuit Blanche, and while my friends complimented me on it, I got a lot of weird looks while walking around at 3AM in the freezing cold. I also got a "Nice poncho" from a drunken lout (unfortunately, Nuit Blanche crowds seem to be primarily made up of boring drunken louts, and also of clove cigarette smokers, yuck). Still, a new friend who lives in New York told me he liked it and identified it immediately as "so APC." So that was nice. 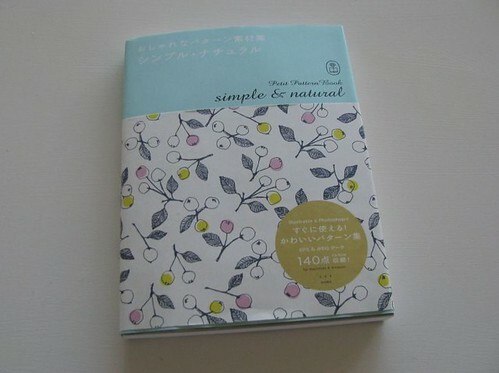 I bought this book the other day at Swipe Books. 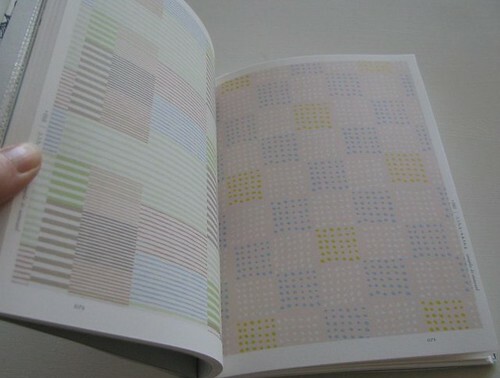 This series of books (from Japan, of course) comes with image files. Amazing! In all, I'm happy with it. It has a million mistakes, but I have started to think of them as charming (this is after two weeks of tears and angst and lots of self-deprecation). I thought I should note that the Cutting Corners quilt is in the 8- to 12-hour gift section of Last-Minute Patchwork, but I have estimated that it took me an average of 4 hours a day for two weeks straight (including two vacation days). Of course, the 8- to 12-hours probably doesn't account for the following: making the quilt queen-sized; basting it, basting it wrong, re-basting; making binding, sewing it on, taking it off, and putting it back on; upper thread breaking all the time (thread tension, it just occurred to me); and the all important "never made a quilt before." I washed it so that it would get all wrinkly and quilty-looking. It's been placed in the drawstring bag I made for it, and now I have to get it to Montreal. Godspeed, little quilt. Unfortunately, I'm feeling overwhelmed by the amount of things I want to make in the next little while. I bought wool and satin to make a winter coat, and even though I'm nervous that I will mess it up or that it won't look very good, I think that will be next. Or maybe I'll make some simple skirts or coasters first. I feel as though I'm drowning in fabric -- can you relate?